Let's get the one uncool thing about Nintendo of America's headquarters out of the way first: They won't let visitors take pictures of the best parts of the building. You can't snap photos of the mural that shows the progression of the Mario, Donkey Kong, Link and Samus characters. You can't photograph the row of Nintendo arcade machines, nor the curiously-placed bronze Mario that stands on a pedestal in the middle of a rounded-off area on the ground floor that's flanked by unnecessary signs warning people not to take photos of it. The signs are unnecessary, because when you walk into the headquarters of Nintendo of America in Redmond, Washington, you sign an electronic waiver in which you promise that you won't bring firearms, will keep any Nintendo secrets you happen to overhear to yourself and won't take unauthorized photos. You can—and I did—capture three spots of the Nintendo HQ for your scrapbook. I'll show them to you, and let you know what cool stuff I can't show but did see during my one-hour tour of Nintendo's offices this week. And I'll explain how it put me out $1.14. The Nintendo of America headquarters is in Redmond, Washington, surrounded by pine trees with mountains in distance and the ring of the many Microsoft buildings in the area all around. You feel like you're in Microsoft territory when you get there, as the roads are full of shuttle buses bearing the green Xbox swoosh and the jarring yet correct spelling of the word Connect on them. Nintendo's footprint is smaller. They've had land here since the early 80s and knocked down their original headquarters a few years back to build a nicer, newer facility for the top management, licensing executives and game translators and writers who work here. No games are made in the HQ, but decisions affecting Nintendo's business throughout North and South America are. The inside of the Nintendo HQ is full of signs that you're in a very Nintendo place. From the outside, the only giveaway is the company sign. But inside, past a two-story-high lobby that includes a Wii kiosk and a big wall screen running Nintendo commercials is Cafe Mario, the place where employees eat. It seats about 600 people, though a retractable wall opens the space up to the 900 or so total Redmond-based employees, including staff from HQ and the customer service building a couple hundred yards away. The retractable wall is covered in massive outlines of Super Mario fire flowers and Yoshi eggs. The cafe looks out to a Wi-Fi-enabled patio, beyond which is Nintendo's Mario-Kart-themed parking garage. If only they'd let me park my rental there, but I'm told each floor has a color theme, some checkerboard patterns and a number drawn in a Mario Kart font. There aren't any item blocks on the roadway, though. No banana peels either. Throughout the building there are cushioned benches shaped like d-pads. My tour guide told me that was not commissioned. It was a fortuitous find by whoever purchased furniture for the HQ. And it fits, given Nintendo's attachment to the d-pad, which they once patented and for which they won an arts and technology Emmy. I didn't realize you can win Emmys for d-pads, but the Emmy itself is part of a display case right near Cafe Mario in the HQ. Nintendo is proud of how green their building is. It opened in May 2010 and received a Gold rating by the D.C.-based non-profit U.S. Green Building Council as part of that group's recognition of Leadership in Energy and Environmental Design, or LEED. That is the story about the Redmond headquarters that the Nintendo folks do want you to see and think of. They're proud of it. My tour guide showed me the big LEED Gold plaque in the lobby and walked me past many of the energy-saving design features. They've got a grand central walkway on each floor made of bamboo, a renewable resource. They've got special vents on the floors, which are raised 20-inches off the concrete floors. In that space are the buildings' wiring and vents, allowing for, Nintendo says, more efficient cooling and heating of the building. There are daylight sensors near the windows that dim or brighten interior lights based on the amount of natural light coming in. There are heat and motion sensors in any of the HQ's many conference rooms. They won't turn the lights off on you if you're sitting still in there… unless you have a cold, cold heart. And there's a living roof. That's the one thing I'd heard about the Redmond headquarters. You reach it via elevator or from a magnificent bamboo staircase leading up from the third floor (the third floor where I think Nintendo of America president works — I saw you down the hall, Reggie. That was me waving). The fourth floor is part conference room space and part walkable roof. 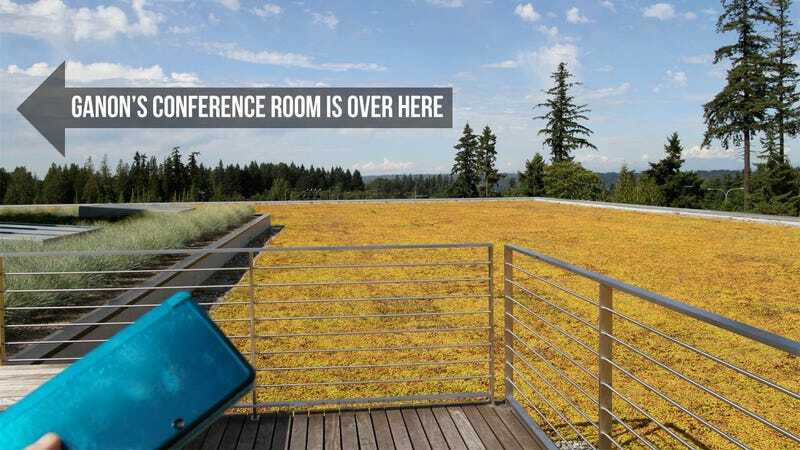 That roof is alive, covered in some 75,000 square feet of Sedum, a ground-covering plant that is used on the headquarters, my Nintendo tour guide told me, to insulate the roof from the sun and to help capture rainwater as it is diverted into a tank nearby and filtered cleanly into nearby streams. Conference rooms in the building are all named for Nintendo stuff. There's the Another Castle room, for example. The top floor is all Zelda conference rooms, including a Ganon room with magnificent views and what sounds like the most important meeting space in the building, the Master Sword. On the third floor, I checked out a sign for the Mario quadrant of the floor. It had a listing of Mario-themed conference rooms: Hookbill the Koopa, Shy Guy, Boo, Bullet Bill, Isle Delfino and Koopalings. The silhouettes for the men's and ladies' room are also Nintendo-themed. I pegged the men's room one for Mario, but my guide convinced me it was Luigi. We discussed briefly if that made the men's room Luigi's Mansion. We were undecided about the ladies' room silhouette. It looked like Princess Peach to me, but maybe it was Daisy. For all the Nintendo touches, the headquarters doesn't feel or look like a silly playhouse. It looks like an office, a roomy one with lots of young Nintendo employees moving about. But there's no Nintendo music playing, no goofiness. There are, though, lots of displays of Nintendo stuff, like near the licensing department, where a case of product includes everything from Guitar Hero guitars to the Big Brain Academy board game and Nintendogs backpacks. The ground floor, behind the entrance desk, near Cafe Mario, is where the HQ most looks like a Nintendo museum—and a shop. There's a row of Nintendo arcade machines, many of them from before Nintendo made games for its own consoles. They're blocked off, so you can't play them, but the row includes their cabinet for Radar-Scope, the Donkey Kong one that followed, some Play-Choice 10 stand-up machines, a sit-down Donkey Kong Jr., the old wire-frame Punch-Out and even a red two-player Vs. Dr. Mario machine. Around the bend from the row of arcade units is the mysterious circular area that surrounds a bronze Mario that stands on a pedestal. I was told that spot is used for employee training. It's the spot marked with reminders not to take photos. On its periphery are display cases that are changed to reflect what Nintendo is promoting. Right now, the case is full of Zelda 25th Anniversary stuff, including an extraordinary over 6'-tall clothed statue of Link. The periphery also includes a wonderful one-story mural that is divided into four horizontal sections. Each shows the sprites and character models for one of four Nintendo icons. Mario get the top section, evolving from the blocky hero of Donkey Kong to modern, modeled figure of Super Mario Galaxy. Below him are similar visual evolutions of Donkey Kong, Link and Samus. Across from the mural, inside the headquarters, is a Nintendo store. Of course you can buy stuff in the Nintendo offices. A kind soul who works there even gave me $50 in gift certificates which I transformed into Nintendo tchotchkes that's we'll give away some day. The establishment is called the Nintendo World Store, just like the one open to the public in New York City. They sell games, systems and a range of Nintendo-themed products from stuffed animals to bibs to Mario Kart race tracks. Most of that can be bought by the public, but I had my guide and a store employee point me to items they believe are Redmond-exclusive, the more corporate stuff: Mario golf balls and tees, Nintendo shot glasses. There were a lot of Nintendo workout clothes there too, but I skipped those. The total ran my $51.14, so leave it to Nintendo to take someone in for a free tour and get them to part with a buck and change. These people know how to sell. I wasn't sure why Nintendo doesn't want people to see how, well, Nintendo-y their offices are. I guess they're keeping it a treat for their employees or discouraging stalkers who really have no hope of getting in there anyway. Words, mostly, will have to suffice. It's a cool space.